Next, away from the manors, a more modest home’s porch plays host to a modern dance performance. 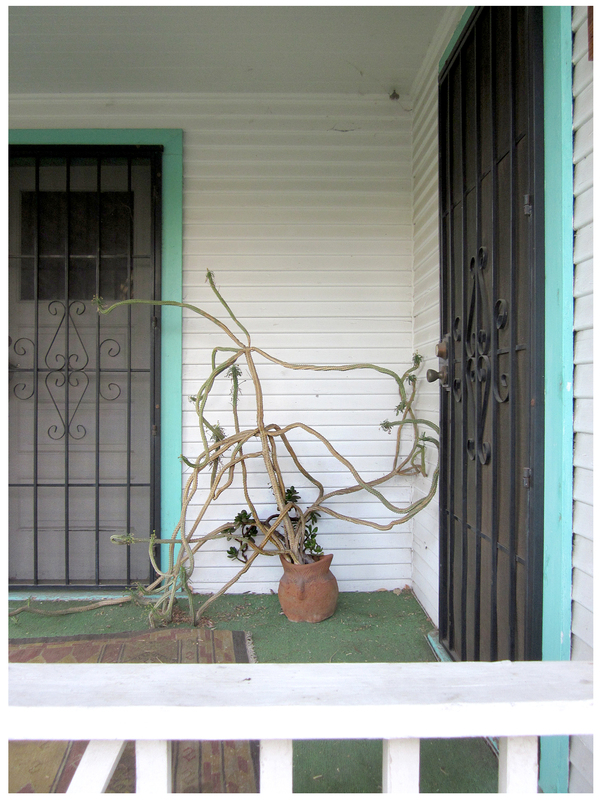 Like dance pioneer Martha Graham in this photo, this euphorbia trigona I’ve dubbed Gnarly, knows the importance of natural movement. All elbows and knees, Gnarly seems to have sprung from the mind of a wise old terra cotta owl who perhaps dreams also of a tidier venue. 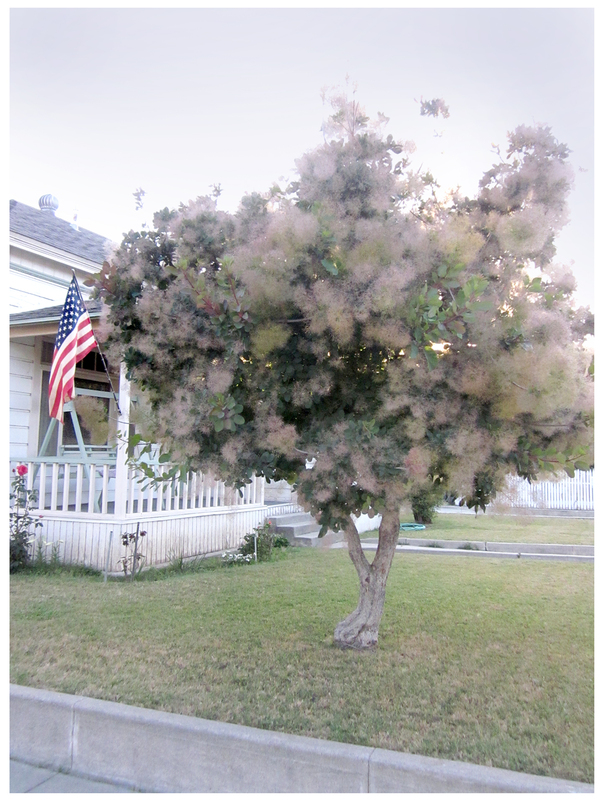 Closer to home, I’m taken by the sight of a cotinus coggygria grown into a small tree, and I dub it: Puff. Covered with what look like smoky puffballs, I love the dreamy effect produced by its buff/pink inflorescence clusters … very ethereal, almost trippy, what with the late afternoon Memorial Day sun behind it. I’ve seen other varieties of this plant that were deep purple/red but with the same “okay, everybody exhale!” effect. I’ve got to get one and work it into the Rancho’s scheme. Blue aluminum puyas, a frilly pink echium guard, a staccato euphorbic twister, a tree that puffs ethereal: all in my neighborhood … I’m sure there’re more local standouts waiting to be discovered, I just have to keep my eyes open. Of course, I’ll report back! 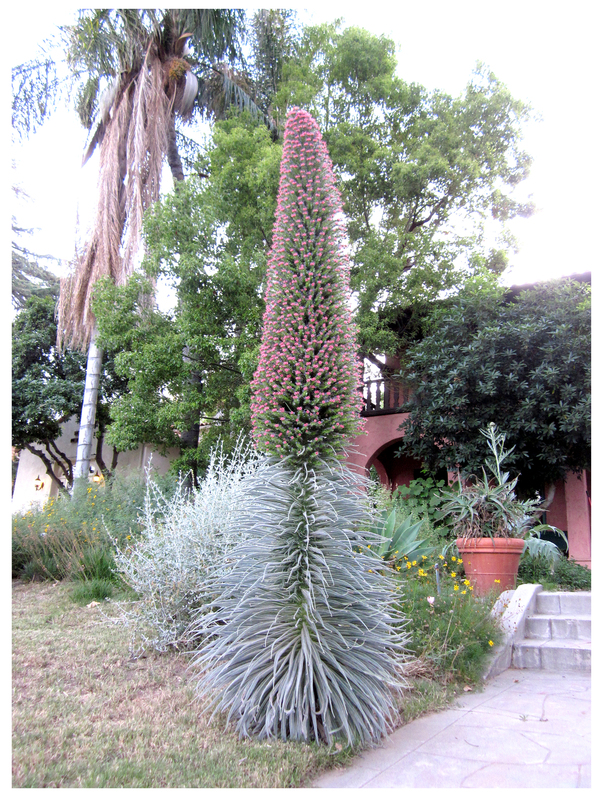 I just saw a lot of that echium at the Huntington, but that one has the best posture I’ve ever seen, and the skirt of leaves is so full, in perfect counterpoint to the flower spike. Beg some seeds from that one! All great plants — my back garden is covered in “smoke” puffs right now. Lucky you, Denise … and congrats on your imminent furcraea macdoug! That poor euporbia looks like it is trying to get away!